It’s wonderful that even the lowly oyster shell is given a chance to shine. oops! How did that extra “t” get in there? 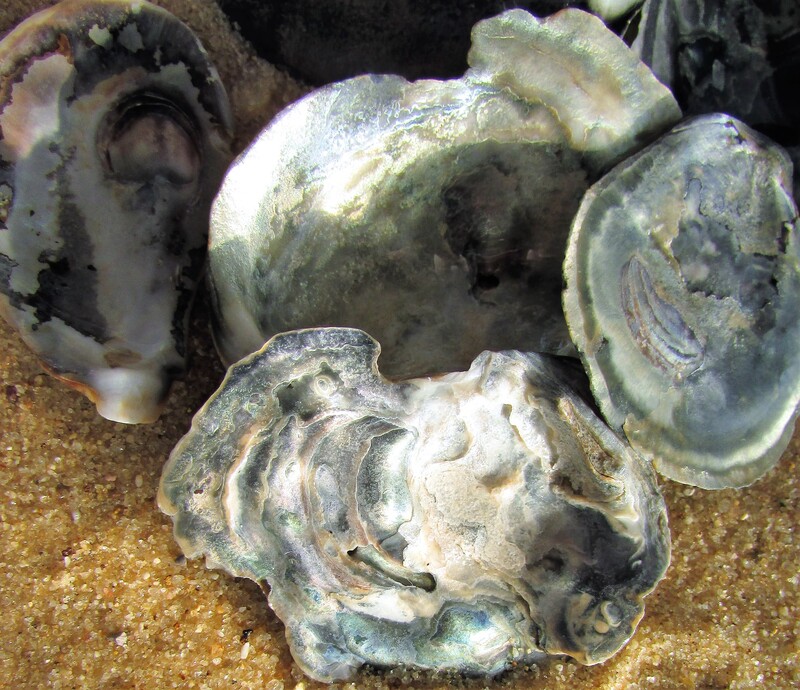 I’ve said to my husband, ‘Imagine if oyster shells were scarce…they would be treasured. I am always fascinated by the markings on them. We often pick them up and look at the underside and always seem to find faces there. 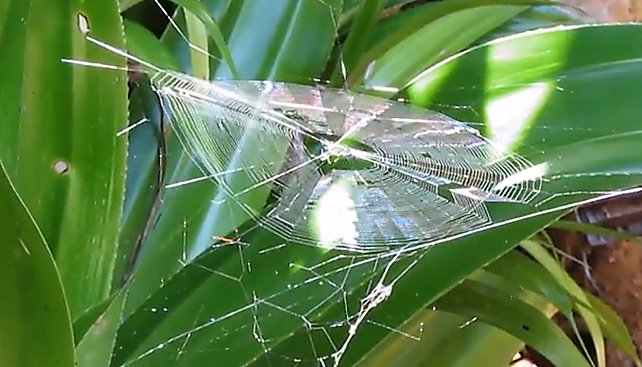 That spider web is amazing. Thanks Sherry, as it moved it shimmered, and appeared to almost be a living thing. Thanks Cee. I so appreciate your terrific challenges…it sets me off on a good direction when I am feeling boggled. The spider web was BEAUTIFUL. Such a versatile blogger you are. If the skies are not what you want, you have a plan b.
I enjoyed the oyster shells for two reasons. I miss seeing them on the beach, and I would just as soon not think of spiders AT ALL! I love oyster shells. I don’t mind spiders as long as they stay out of my house. The spider web is lovely! Thanks…it was one of those natural beauties that surprise and take your breath away. The upturned oyster shells are beautiful! 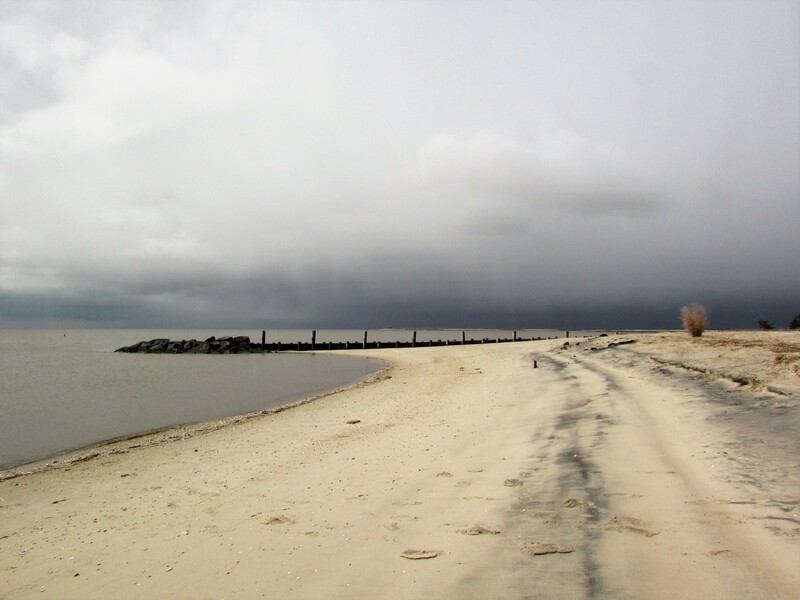 And a beach in any weather is, to this now-prairie-dweller, better than no beach at all! Two weeks ago I visited a friend in the Dallas-Fort Worth area. She once lived here on the east coast, and she loves Texas…except for not having the ocean nearby. I hope I always live near the sea. I find such beauty in the sea treasures it leaves scattered along the beach…even the bays have treasure. Thanks for stopping by and the comment. The photos are beautiful!!! Thank you for sharing them with us.